Wouldn’t it be nice to have a tool that helps you find it ? b) your device is configured to use your iCloud account. To configure iCloud, make sure your iPad is connected to the Internet. Then tap on Settings > iCloud. Enter your Apple ID and Password. Then tap on Sign In. 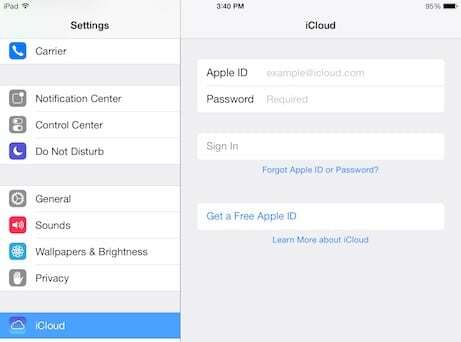 You may be asked if you want to merge the information you have on your device with your iCloud account. It’s up to you to decide. Also, you will be asked whether to allow iCloud to use the Location of your device. 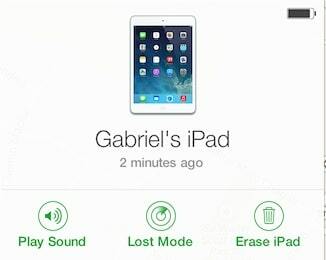 Since you are planning to be able to locate your iPad, you may want to tap OK.
Let’s pretend for a moment that you have misplaced your iPad (Oh no!!). Fortunately, your data plan was on when you forgot it at the coffee shop which means your device is online. or you can download and login to the “Find my iPhone” App on another iOS device (i.e. iPhone). You will have to Login with your iCloud email address and password. In both cases, the find functionality will provide you with 3 options. 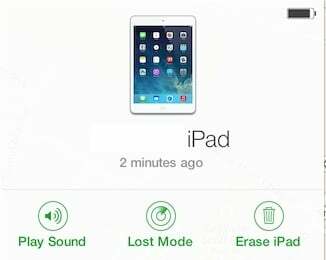 Play Sound, Lost Mode and Erase iPad. Play Sound allows you to remotely play a sound (really noisy and disturbing!) so that you can locate your device if it is nearby. Lost Mode allows you to remotely lock your device with a passcode and display a message on screen so that whoever finds it can contact you and return it (counting on those good samaritans still left in this world…). Erase iPad lets you remotely wipe your iPad’s data in case you have strict confidential information that you want to protect from falling in the wrong hands. In this example, I’ll select Play Sound. 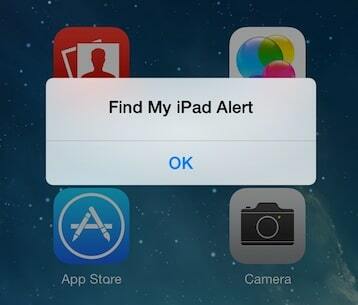 You will hear a loud noise and an alert popup will appear on the iPad screen. Tap on Ok to stop it. I have observed that when you play the sound, you also get an email from Find My iPhone specifying that an alert was sent to your device. Spending a few minutes configuring iCloud on your iPad today can provide an extra layer of protection in case your iPad is misplaced. This is a preventive measure that can help you especially on iPad models that have a data plan enabled. Have you configured iCloud? Did you try the find functionality? I would like to hear from you. Please let me know by leaving a comment below.